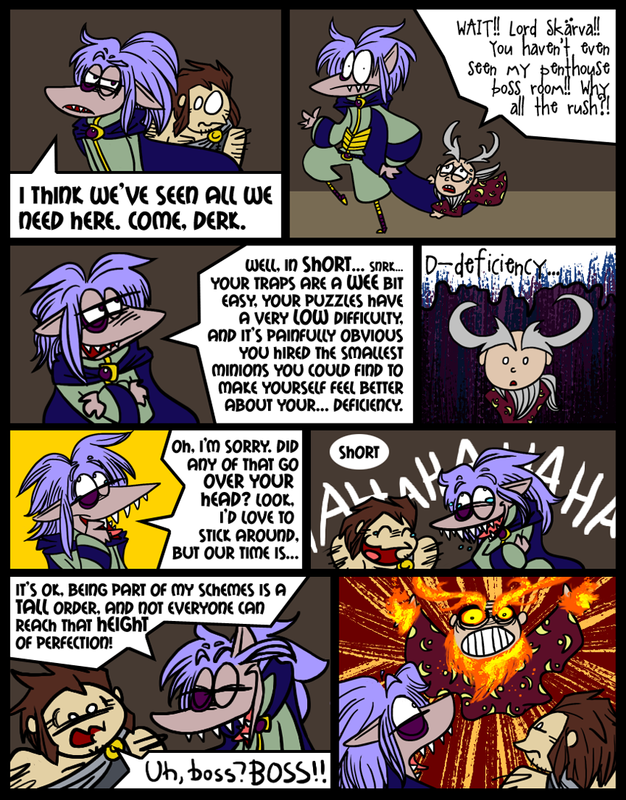 Skärva is being particularly mean here because the wizard touched his cape in panel 2. Yes there are two short jokes involving the word “short.” Deal with it. Anyways, Courtney wrote this one because she knows these jokes best. That’s right, friends! Did you know your dedicated artist is only 4’10”? I enjoy making fun of myself and was happy to unleash this barrage of bad puns upon you. Anyway, as my hero J.R.R. Tolkien once wrote, “Do not meddle in the affairs of wizards, for they have crappy temples and are quick to go berserk.” That may be paraphrased slightly. so u guys take turns making the strips?? Aww, thanks! And that’s exciting – keep us updated! You’re one of our most dedicated fans so I’ll be sure to check it out! Wow, I’ve been reading since I saw your original post on Facey-space. This is great. I also just noticed that the female in the top right of the page looks VERY familiar. Great comic guys. Keep it up. Wizard unleashes PURE RAGE. It is super effective! that expression is so great in that last panel. xD I keep going back and giggling. Thanks I really love that panel… the fire was super-fun too. I will never be able to watch Firefly without thinking of this now.